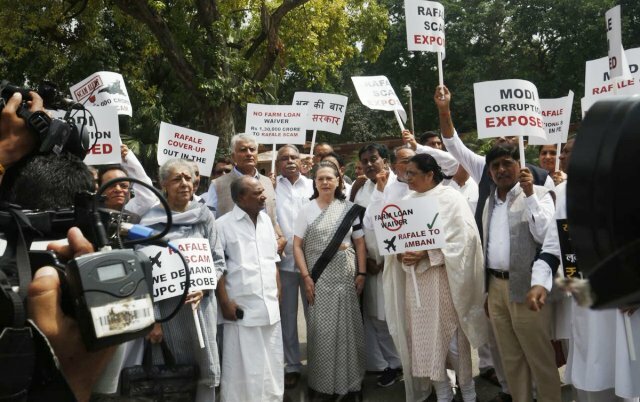 On the last day of Parliament’s monsoon session, UPA Chairperson and Congress leader Sonia Gandhi on Friday led her party MPs in protest against the Modi government over the controversial Rafale deal India has signed with France to buy fighter jets. Congress leaders, flashing placards and demanding a Joint Parliamentary Party Committee (JPC) probe into the alleged scam, assembled near the Gandhi statue in Parliament lawns where they indulged in slogan shouting, denouncing the government. The placards read “Modi corruption exposed”, “Rafale cover-up out in the open”, “Rafale scam: we demand JPC probe”, Modi’s Rafale gate” and “No farm loan waiver — Rs 130,000 crore to Rafale scam”. Rajya Sabha Leader of Opposition Ghulam Nabi Azad, former Defence Minister A.K. Antony, Ambika Soni and senior party lawmakers participated in the protest. Congress members later protested in the Rajya Sabha as well disrupting the House briefly. “This is the biggest scam of the world. We demabd the formation of a Joint Parliamentary Committee to investigate the Rafale deal,” Azad said in the Rajya Sabha. Minister of State for Parliamentary Affairs Vijay Goel dimissed the allegations, saying the Opposition MPs needed to have substantial proof if they accuse the Prime Minister of graft.